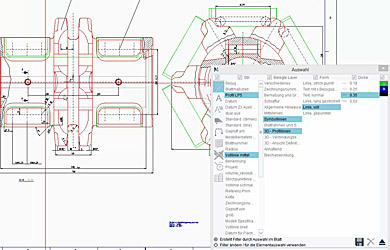 MEDUSA4 has various view functions that make it convenient and easy to navigate within a drawing. There are zoom tools, for instance, that can enlarge or shrink individual areas of a drawing. The mouse wheel can also be used for normal zooming. 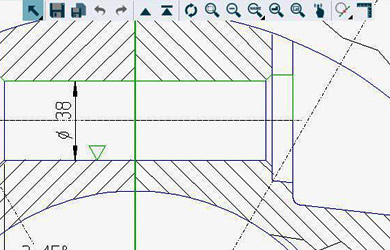 Users can also zoom in on a single highlighted object. In addition, the individual enlarged areas can be saved as views within the drawing. Users can then open these again and again while working on the drawing. MEDUSA4 provides the option of temporarily hiding individually selected elements while editing a drawing. This function gives users a clearer overview while editing individual objects, since the editor is not distracted by other visible objects. Naturally, the hidden elements can easily be displayed again, with a simple selection. 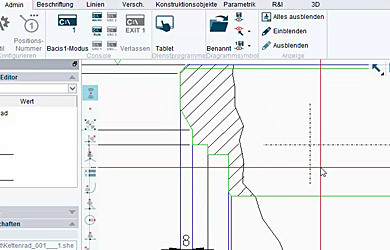 MEDUSA4 has a variety of selection tools for conveniently selecting individual elements in a drawing. 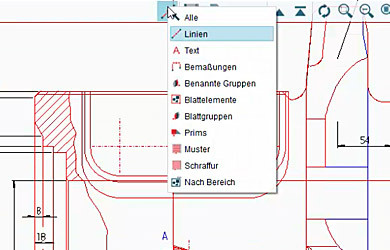 The standard selection tool lets users choose individual elements or element groups within a certain area. In addition, they can use filters to select only the lines, text, dimensions, groups or cross-hatching, for instance, within an area. They can also determine which reference points will be used to select the objects. Naturally, selections can also be automatically inverted. In addition, elements can be selected using an attribute. MEDUSA4 provides an option to make selection of elements from a large data amount easier. The tool allows selection by any combination of class, style, layer and colour and their properties. These can be set as a filter in the dialogue and then selected in the drawing. It is also possible to filter by selecting one or more objects and then using the tool to select all other objects of the same type.